Château Saint-Pierre is the smallest and least well-known of the St-Julien crus. Ch. Saint-Pierre is a property with a long and complicated history. The estate was founded in the 17th Century, and classified a 4th Growth in the 1855 Classification of Bordeaux. Carved up over the years by family disputes, the Château was eventually bought in 1982 by Henri Martin, the son of a Bordeaux cooper. Henri already owned the Cru Bourgeois Ch. Gloria, but to own a Cru Classé was his lifetime ambition and he invested all his soul and a considerable amount of money into resurrecting this great property. Today the property sits at the top of the 4ème Cru Classé, and is quietly becoming that rare thing in Bordeaux, a truly undervalued wine. The lovely Château is found in the heart of St. Julien, in the village of Beychevelle. Bordered by Gruaud Larose to the west and Ducru-Beaucaillou to the east, the vineyards are wonderfully located on deep gravel soils – the ideal terroir for the Cabernet grape. Stylistically as well as geographically, the wines of St. Julien fall between those of Pauillac and Margaux. 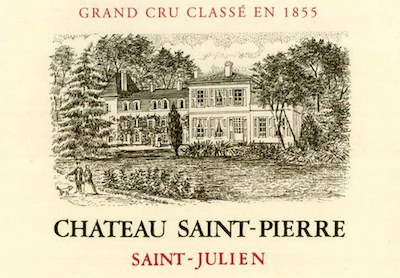 Saint-Pierre itself often displays a wonderfully fragrant, Margaux-like nose, allied to a dense, cassis laden palate more akin to Pauillac. Saint-Pierre has only 17 hectares of vineyards and the wine is typically a blend of 70% Cabernet Sauvignon, 20% Merlot and 10% Cabernet Franc. It is aged in oak barrels (50% new) for 18 months.